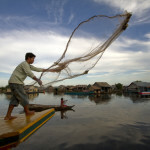 Five provinces circled the area of Tonle Sap Lake, more than three million of population inhabited around the bank of the Lake and 90% of them earn a living by catching fish and making agriculture. As you can see on the map of Cambodia It stretches across the northwest section..
Angkor Wat was built in the first half of the 12th century (113-5 BC). Estimated construction time of the temple is 30 years by King Suryavarman II, dedicated to Vishnu (Hindu), replica of Angkor Thom style of art. 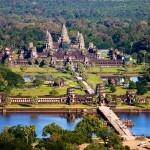 Angkor Wat is located about six kilometers north of Siem Reap,..